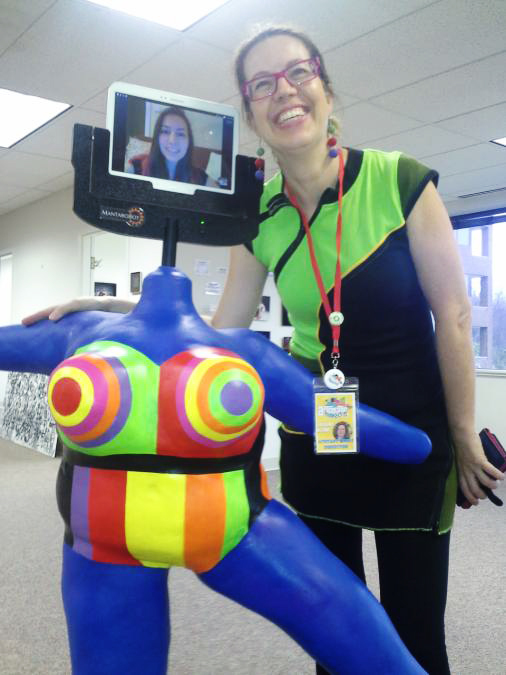 Manta is a robot that has been transformed into a piece of art by Liliane Blom and can be seen on the move and/or operated remotely and communicated with during Artomatic 2015 - AOM is the planet's largest group art show and it happens in the DMV! AOM is running through Dec 12th 2015 in New Carrolton Maryland. The goal of this art work is to connect art show visitors on a local, national or international level with each other through the assistance of a remote controlled robot that has been modified as a piece of art. The artwork touches on questions of community - and connections created though the bridging of distance through cyberspace. Liliane Blom has called her piece Manta for the robot company Mantaro in Germantown, MD (www.mantaro.com) that built the robot. The robot ,"before" being transformed, consists of a wheeled base with a pipe and a tablet at the top. It was designed as a communication device for the homebound elderly and as a mobile teleconferencing device. Liliane created an artwork around this skeleton. She believes Manta enables conversation and creates links between people who would otherwise not connect. The controller interacts with viewers through Manta and can travel through and experience the exhibit without ever physically being present . She believes that Manta can be an interaction facilitator, helping bridge and break down the social conventions (or geographical locations) that keep people from interacting. She believes people will react positively to this colorful, humanoid art piece that talks - operated by a real live person.... somewhere. On her fist foray Manta was operated from Norway as well as locally and was a big hit with visitors. To operate Manta remotely Liliane Blom needs to be contacted in advance so she can help the operator log on to the software and access Skype. Manta is a papier mache and plaster sculpture built around a pvc pipe threaded around the conduit pipe connecting her tablet head with the base. The head communicates and sees the world through the help of Skype and the base is controlled separately through a proprietary software. The base has been altered with "training" wheels to keep her more stable.